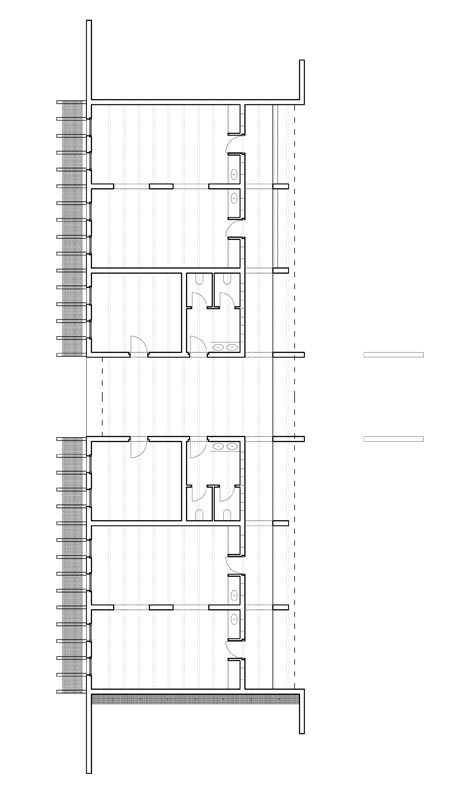 – Build a multipurpose architectural, including three buildings that are intended as models of three different proposals for sustainable architecture. – Construct a building complex without generating waste, or emissions of any kind. – Use only salvaged, reused or recycled. 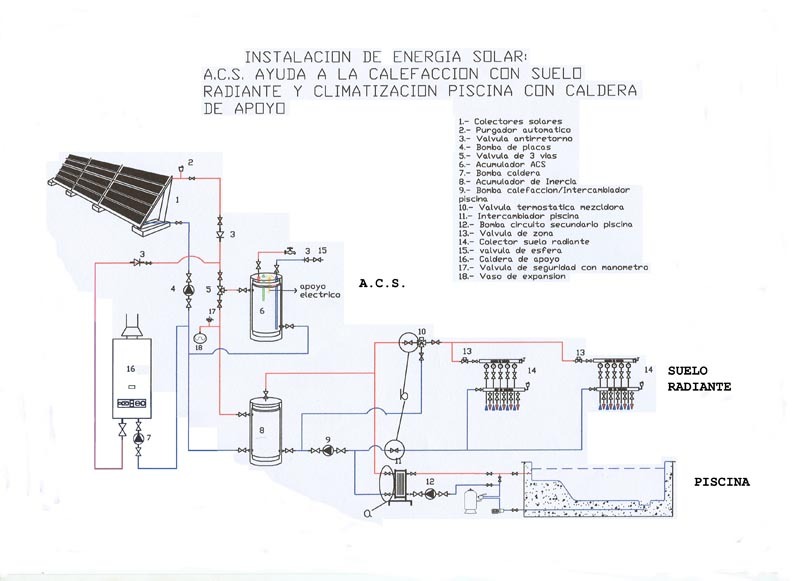 – Reduce the maximum energy consumption, and use only alternative energy. 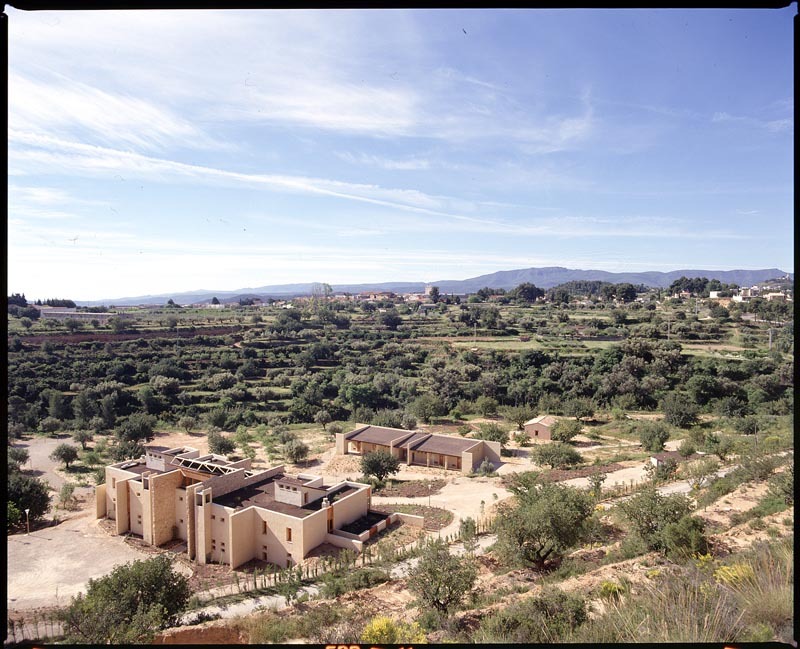 The environment in which the building stands was completely degraded (in the process of desertification, with a high erosion, due to occasional floods caused by rain water. Therefore, in the first place has been enhanced a complete ecological reforestation, and carefully studying the most convenient location of the three buildings of the complex. 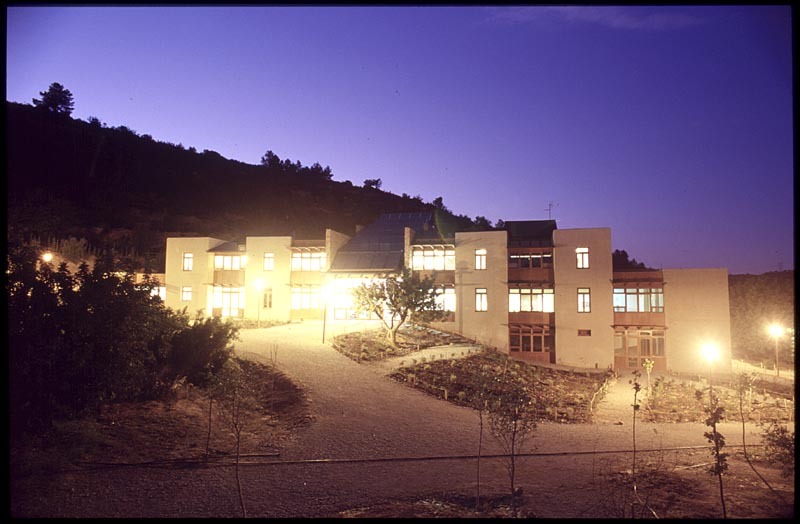 1.The building A, is a center for cultural activities, training and research. 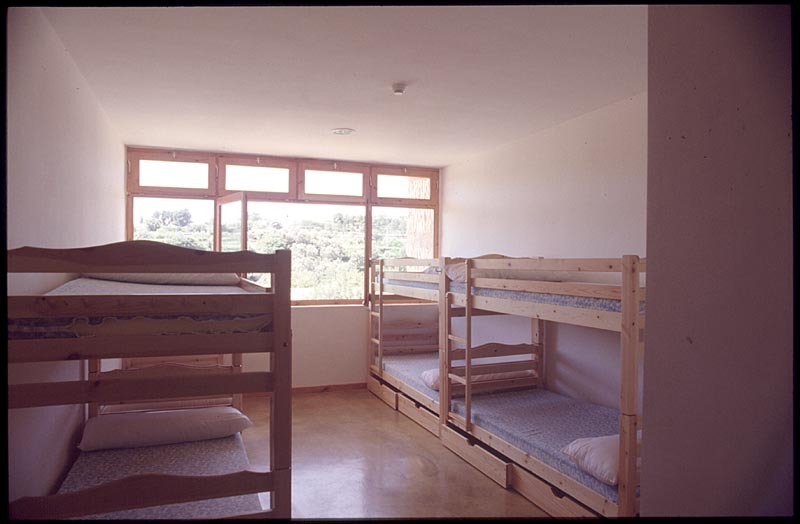 At the same time is for youth accommodation with stays of varying length and families on weekends. 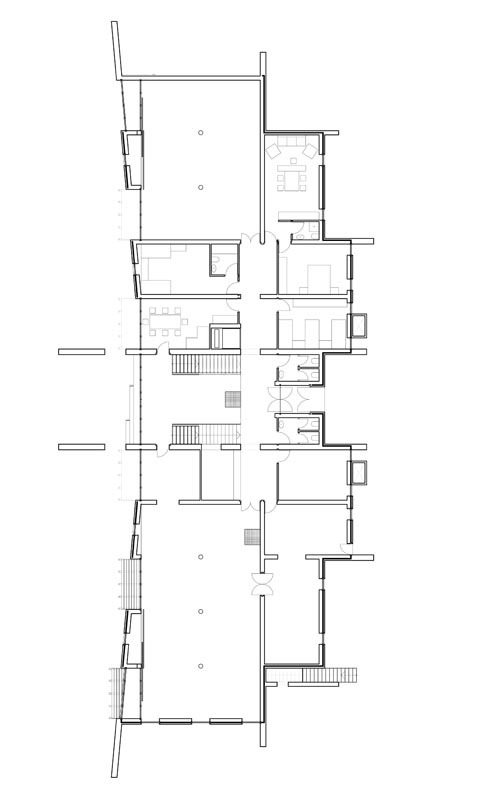 The architecture is very simple and consists of three parts. 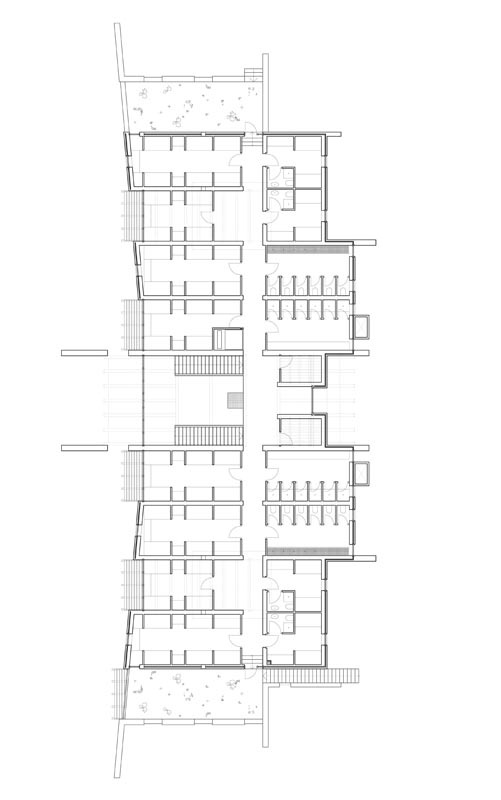 The central part is the reception and distribution space, and has three floors. The structure aisles meeting spaces and bedrooms around the corridors of distribution. 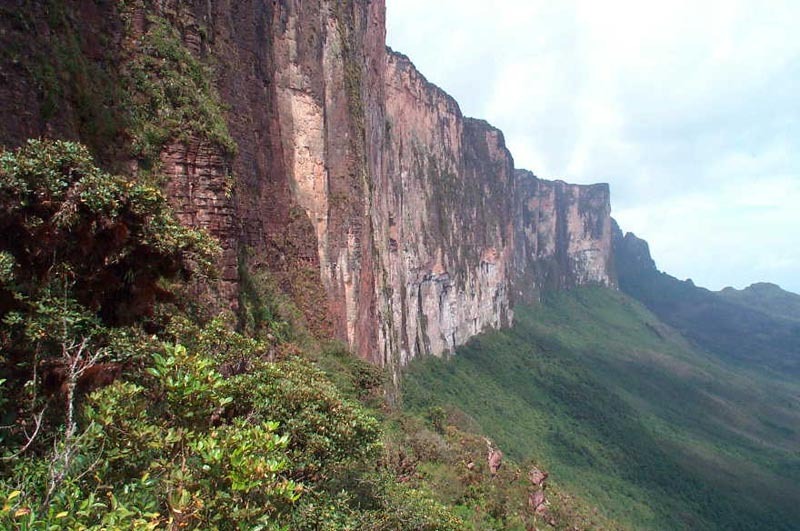 The project has been proposed as a model of sustainability extreme highly developed countries. The building completely self-sufficient in every way, offering every comfort. 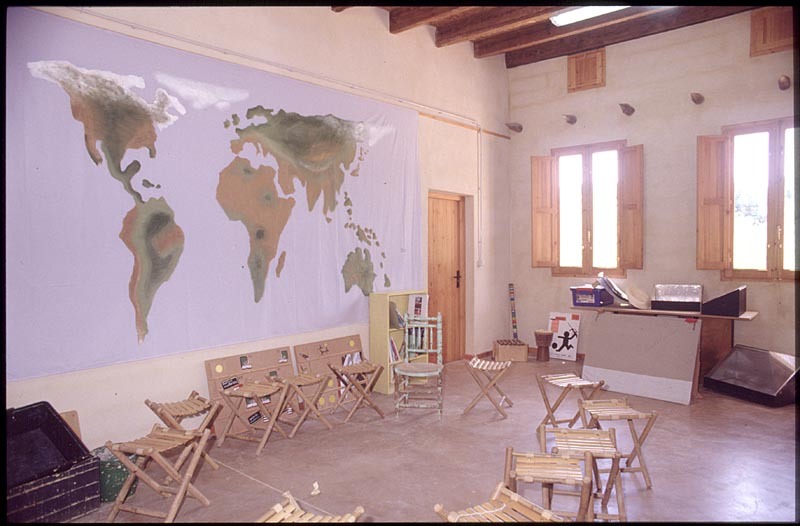 2.The Building B, is designed to workshops and educational activities. The project has been proposed as a model of sustainability very low cost, therefore, can serve as reference for the development of poorer countries. Is an example of how much you can do with very little, using all kinds of waste and recycled materials. 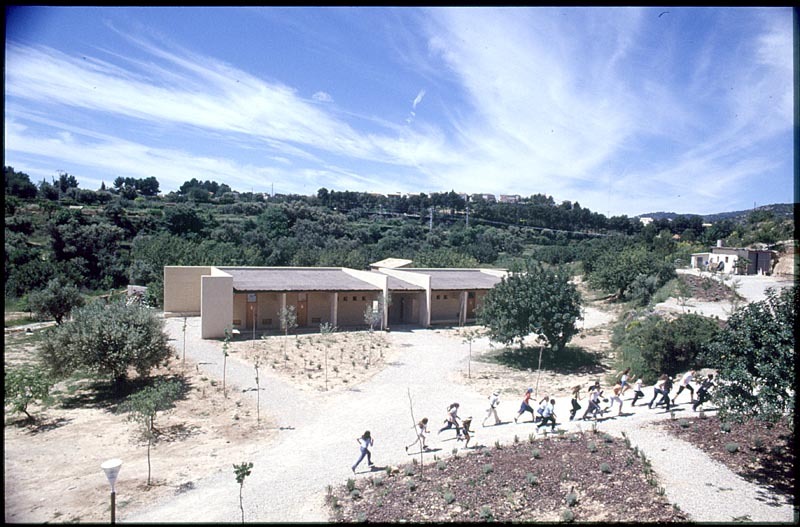 3.The building C, is an Eco-Museum. 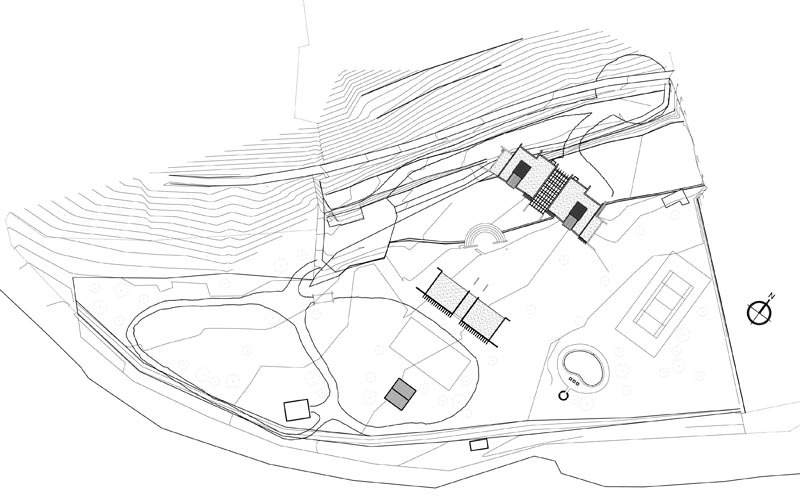 The project has been proposed as a model of sustainability vernacular, as it has a similar architectural structure to the vernacular of the area. The building has been built solely with waste and excess. 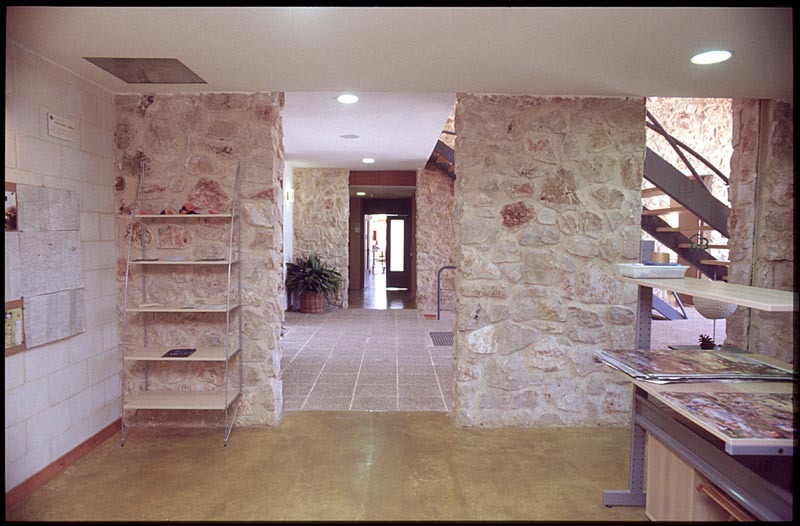 Materials left over from the construction of Building A, and recovered and reused materials, has built the building B. Materials left over from the construction of Building B, along with various residues, the building was built C. Finally, with the few remaining waste has been built part of the furniture and filling have been used for the construction of small hills of soil in the forest area of the complex. 1.1. Natural Resources. Are maximized resources such as sunlight (for home heating), the breeze and land (to cool the housing), rain water (for watering the garden and flushing toilets), the rocks of the place ( for load-bearing walls of buildings), grass and heather (for covering sloping roofs), reeds (for the sun visor), branching tree trunks (for the structure of the umbrellas), hemp (for isolates), cork black (for isolates) … .. On the other hand, we have installed water saving devices on taps, showers and tanks of the complex. 1.2. Manufactured resources. The materials used are maximized, thus preventing any waste through proper project and effective management (concrete, bricks, wood joinery, plywood, paint, …). On the other hand, the proper design of the building, using load-bearing walls, can only be built without assistive devices (such as scaffolds, cranes, etc …). The vast majority of building materials may be recoverable and reusable (carpentry of wood, glass, wood beams, girders, decks, stairs, walkways, cabinets, wood coatings, sunscreens, health …). – With clean sludge trucks compacted concrete has been the bed of a creek that runs through the complex. – With the boards from the pallets (wooden bases which serve as building materials) has built a small bridge over this stream. – Wooden beams for the sloping roof, from demolition in neighboring municipalities. 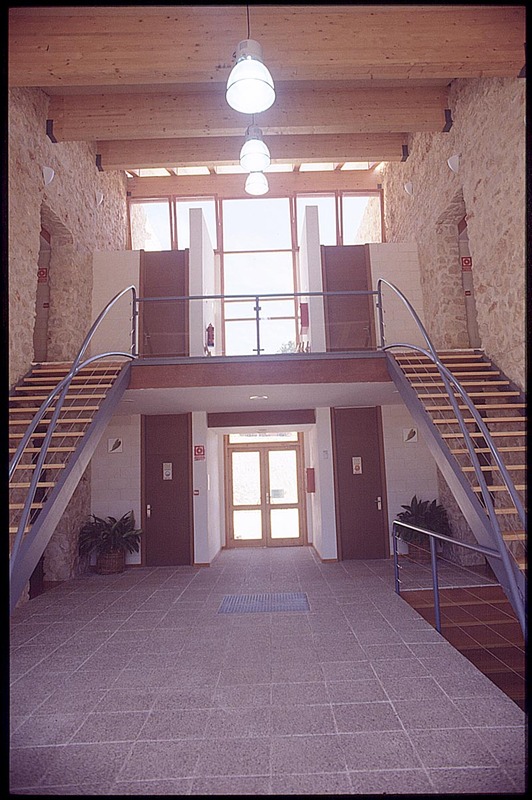 The buildings have been built with low energy consumption. The materials used are manufactured with minimal energy. On the other hand, the buildings have been built with little supporting resources, and with very little labor. 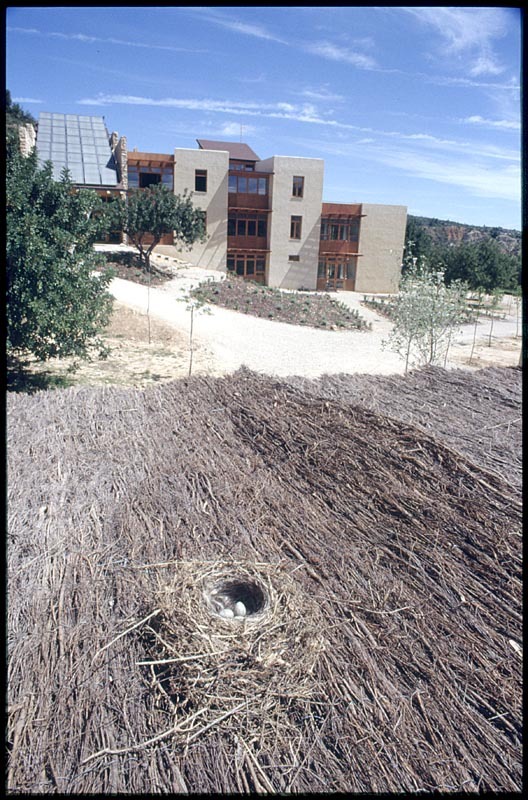 Due to its characteristics bioclimatic buildings have zero consumption of conventional energy is not renewable. 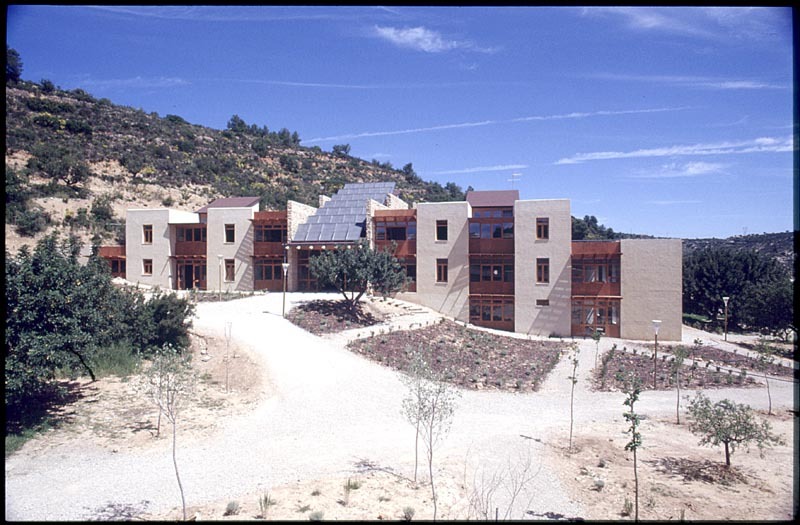 The buildings are heated by greenhouse gases and a system of floor heating powered by solar thermal sensors 35 (which also provide the necessary hot water, and heat the pool water.) The backup boiler is biomass. On the other hand, the buildings are cooled by means of bioclimatic architectural systems, so they do not have any energy. The vast majority of materials used can be recovered easily (once the life of the building) to be reused in the construction of another building (wooden beams, roofing, ceramic tiles, windows, shutters, railings, doors. .). On the other hand, the buildings have been designed to have high durability and life cycle of hundreds of years, since all its components are easily repairable. Thus, there is no question of dismantling, but ongoing maintenance, with very low power consumption. 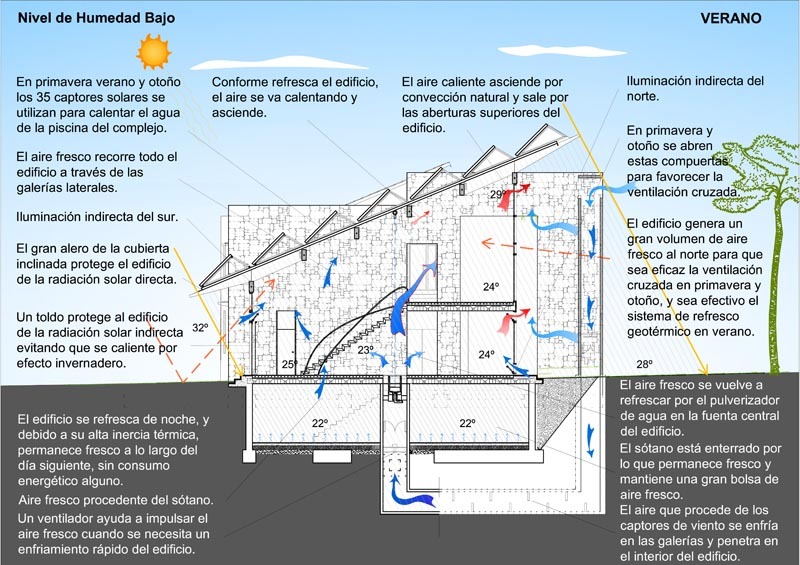 The energy used is of two types: solar thermal (solar collectors for hot water and underfloor heating, and evaporation of water to air cooling) and geothermal (air refresher system taking advantage of low temperatures to 2 feet below existing land, in the underground galleries). The buildings are partially buried, so that its temperature tends to remain stable throughout the year. All materials used are environmentally friendly and healthy, and do not have any programs that might affect human health. Similarly, the buildings are naturally ventilated, and make the most of natural light (no artificial lighting can be used as long as natural lighting) creating a healthy environment and provides the best possible quality of life for its occupants. The buildings are designed in a rational manner, eliminating redundant items, unnecessary, or free, allowing construction to a greatly reduced price, despite incorporating environmental equipment. For example, no paintings have been used as mortars used were colored, there have been no slots for the facilities have not been used in ornaments, … .. Similarly, the buildings need a low maintenance, routine cleaning, and processing wood biennial vegetable oils. The buildings are heated, by themselves, in two ways: 1. Avoiding cool: Due to its high thermal insulation, and having most of the glass surface to the south. 2. Because of his careful and special bioclimatic design, and perfect NS, buildings are heated by greenhouse gases, direct sunlight and radiant floor heating based on solar-heated water. The buildings are cooled by themselves in three ways: 1. Avoiding hot, providing the bulk of the glass surface just south and west, providing sun protection for the direct and indirect solar radiation, and providing adequate insulation. 2. 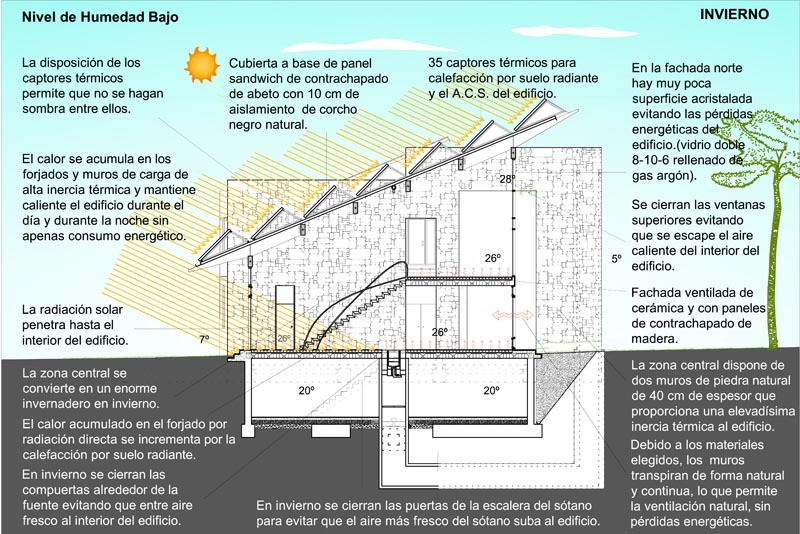 Cooling by a cooling system architectural air through underground tunnels. 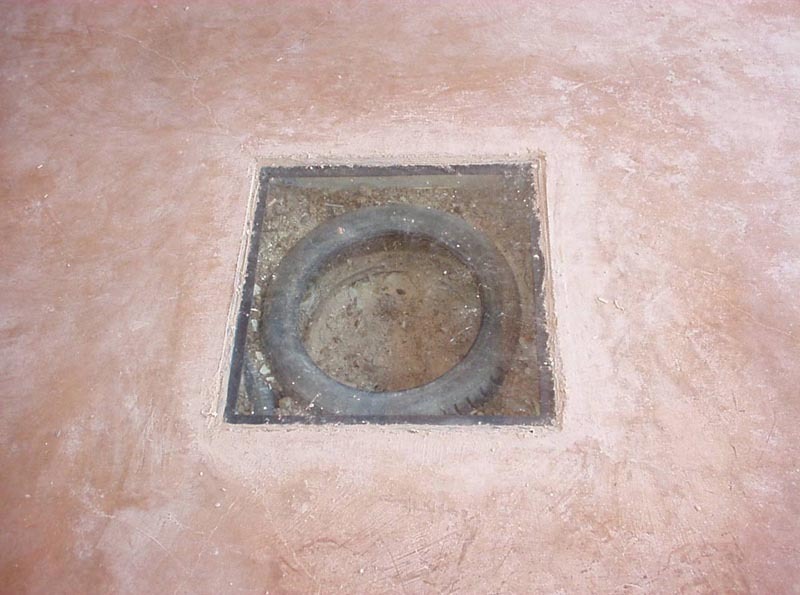 Two wind sensors collect air from the north and channel them to a set of tunnels under the floors sanitary. The air transfers its heat to the labyrinth of walls in these galleries, and cool. The air enters buildings through openings in the central courtyard where a fountain with a spray of water, through which the air cools a bit more (this is possible because the humidity is not high .) On the other hand, due to high thermal inertia of the buildings, the accumulated fresh overnight stays for nearly all the next day. The fact that the buildings are partially buried enables the shop to maintain uniform temperature throughout the year. 3. Evacuating the hot air outside of buildings, by two mezzanines and large central space. Its special architectural form enhances the natural convection and provides an effective “chimney effect” to extract the hot air inside buildings. 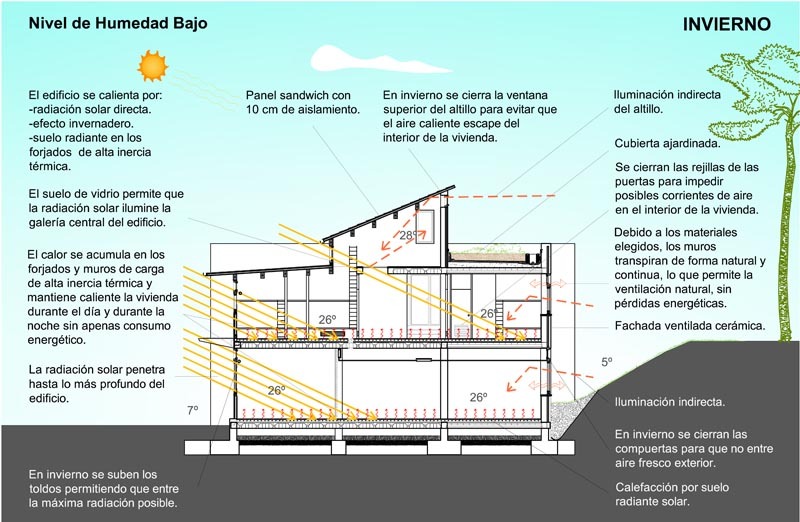 The heat generated during the day in winter (greenhouse effect, solar radiation and the system of solar radiant floor heating) accumulates in the floors and interior load-bearing walls of high thermal inertia. Thus the buildings remain hot throughout the night, with little energy. 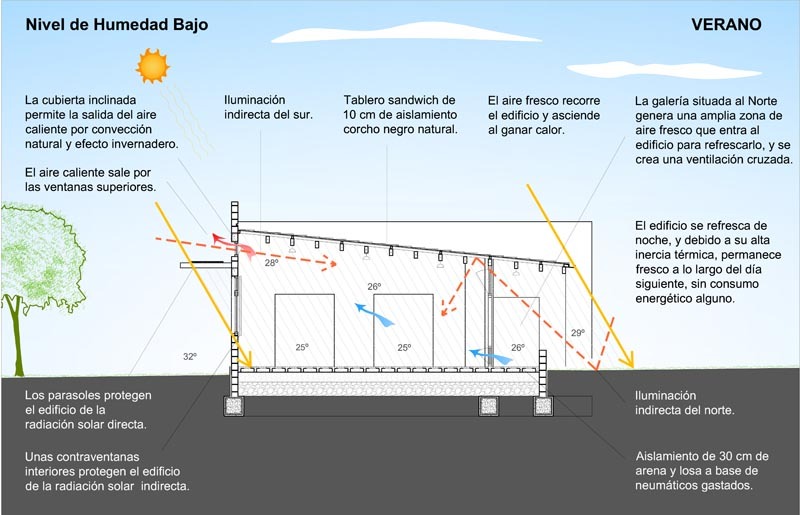 Generated during the cool summer night (for natural ventilation and outside due to lower temperature) is accumulated in the floors and interior load-bearing walls of high thermal inertia. Thus, the buildings remain fresh throughout the day without any energy consumption. The roof garden (about 25 cm. Of land) of high thermal inertia, in addition to proper isolation, maintains a stable temperature inside the building, which is kept warm at night and cool during the day. The heat generated by the greenhouse effect, natural radiation and soil heating is distributed in the form of hot air throughout the building by the central corridors of distribution. Similarly, the heat accumulated in the load-bearing walls is transmitted to the rooms after radiation. The cool air generated in the underground galleries are distributed in buildings, through a set of grids spread over the floors. 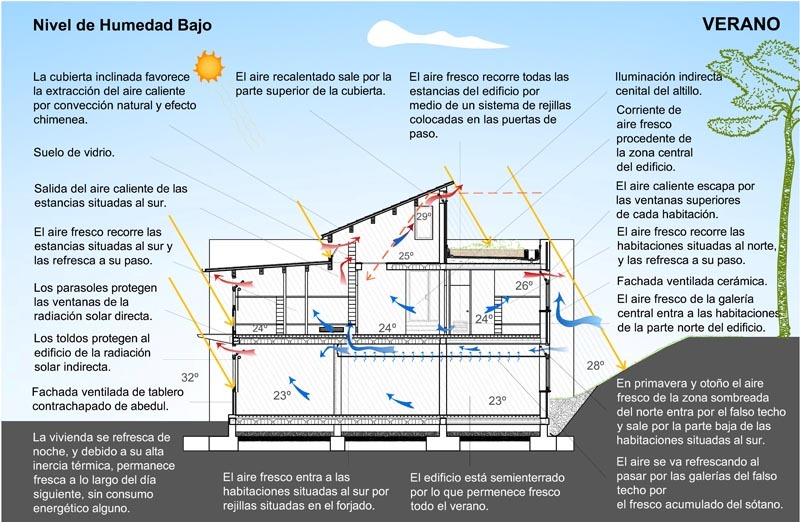 The ventilation of buildings is done in a continuous and natural, through the very walls surround, allowing adequate ventilation without energy loss. 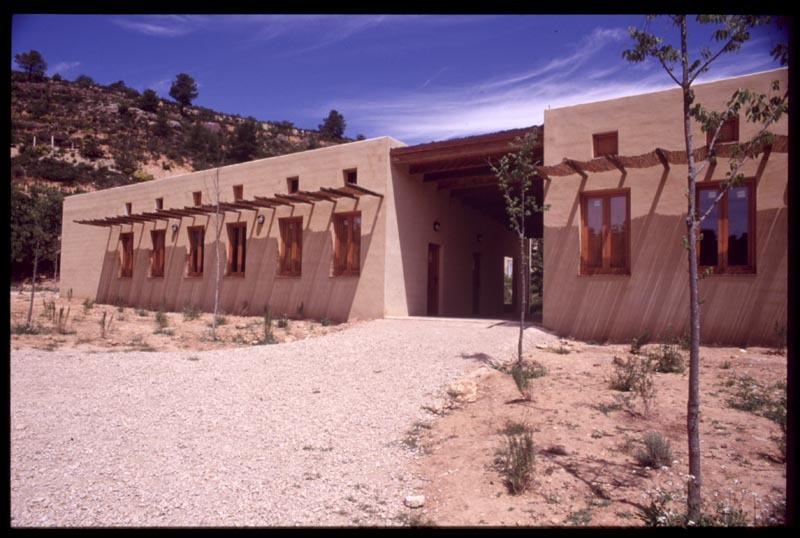 This type of ventilation is possible as all materials are breathable (ceramic, lime-cement mortar, paint silicates), although the whole performance has a completely waterproof compared to rainfall. Double-leaf walls. 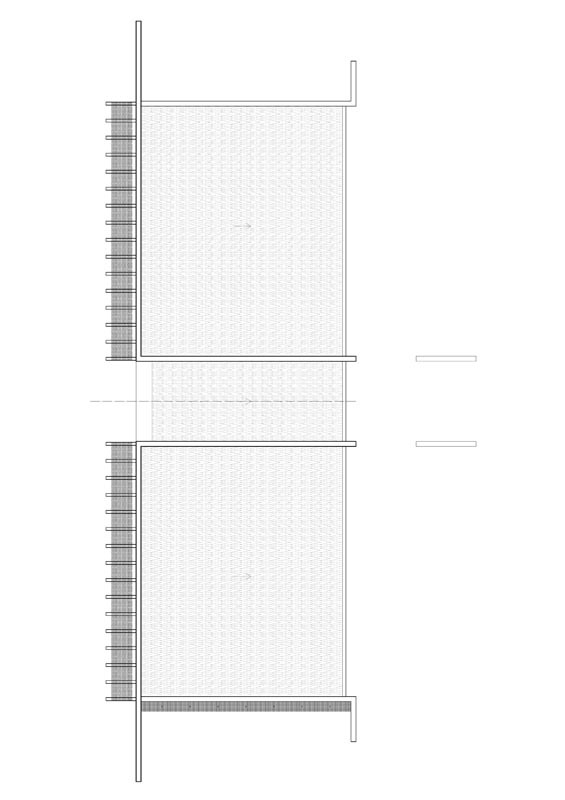 The inner blade is the load bearing wall of concrete blocks 20 cm. thickness (with high thermal inertia, as they have been filled with concrete or sand). The blade is hollow brick exterior of 7 cm. Inside the double sheet is a layer of hemp insulation 5 cm. and a ventilated air space of 3 cm. (In some parts of the front outer blade is made out of birch plywood panels prepared by battens, including an insulating layer of hemp than 5 cm, and a ventilated air space of 2 cm.) Forged semiviguetas prestressed and concrete slabs. 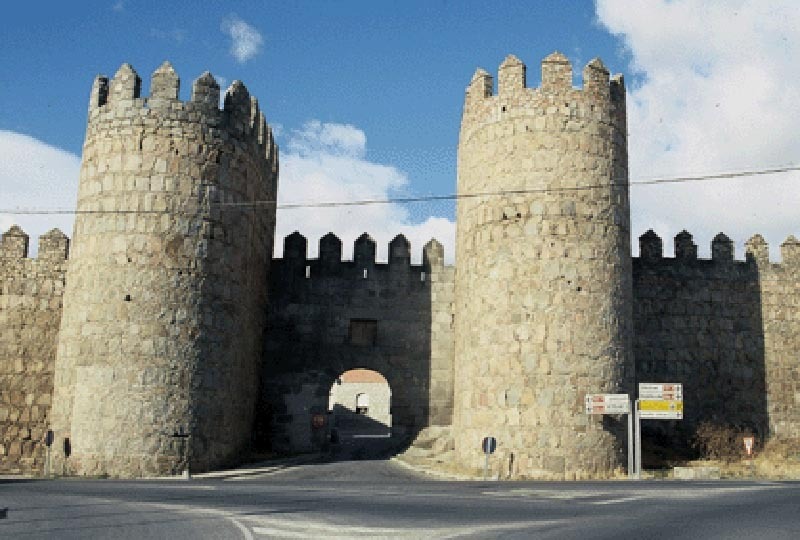 There are batteries inside walls have been made out of concrete formwork stones. Lime mortar with sand (waterproof). Birch plywood treated with vegetable oils. Vegetable paintings. 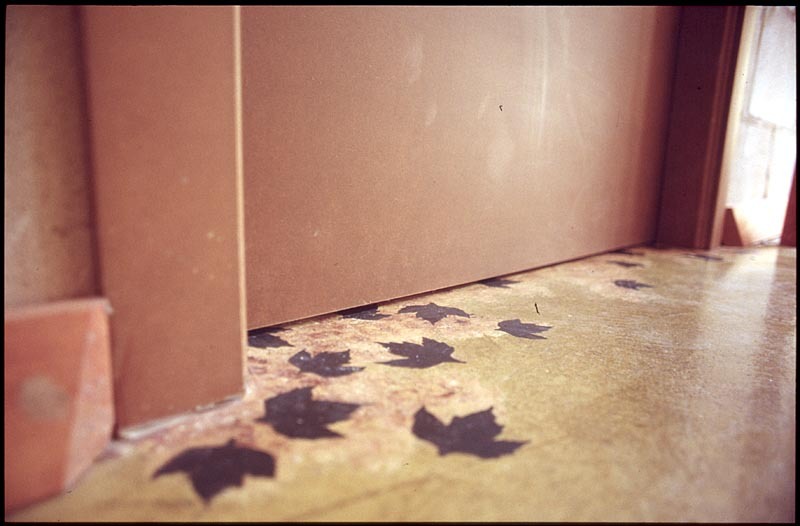 Flooring continuous grinding mortar base colored with natural pigments. 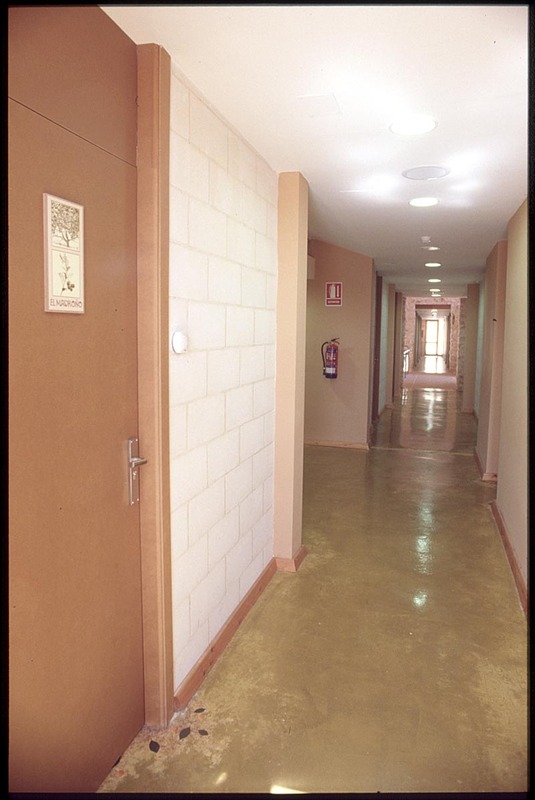 Solid doors based on two chipboard DM, and treated with vegetable oils. Roof garden, with an average thickness of 25 cm. ground. Sloping based sandwich board comprising: Viroc top board (wood chips and cement) of 13 mm, bottom panel birch plywood 13 mm, and internal insulation crushing black cork 10 cm. thick. Based coating rubber sheets and corrugated iron. Polypropylene water pipes. Polyethylene drainage pipes. Energy-efficient appliances. Pine woodwork treated with vegetable oils. Cotton canvas awnings. Sunscreens solid pine wood, treated with vegetable oils. All woods used have a certificate of origin with selective logging and ecological treatment (FSC). – Strategies for reducing construction costs. ACTIO complex has cost 50% of the cost of similar conventional buildings. 1.Se has designed a construction system that eliminates the need for aids, and allows the use of low-skilled labor. 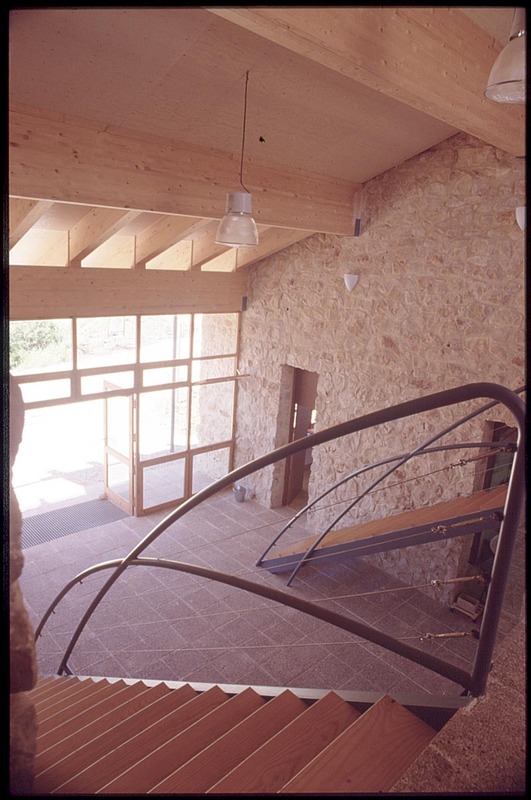 2.Se have ennobled by the architectural design and common natural materials, which are very economical. 4.The buildings have been self-managed without promoter. On the other hand, the property has hired and supervised a team of professionals directly responsible for constructing the complex. – Type of energy-efficient architecture. The complex of buildings consumes only 10% of what it consumes a conventional building with the same floor area and the same use. – Ecological system of treatment and purification of drinking water, without using chlorine. 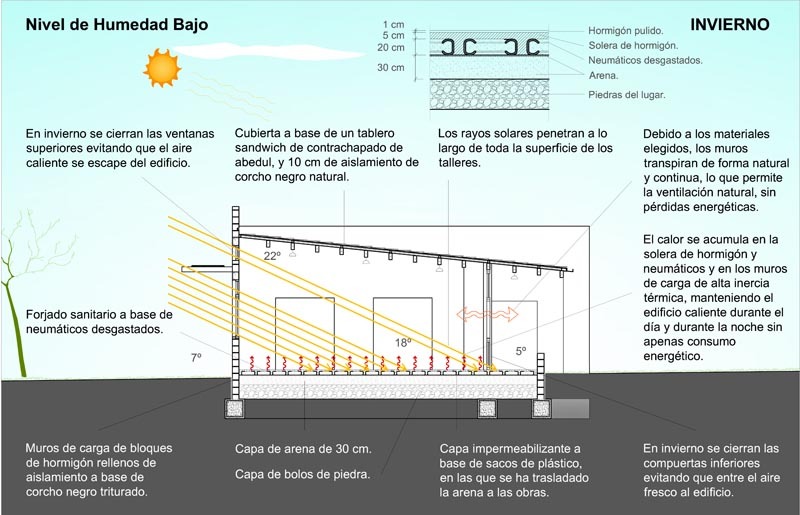 – Building system of bearing walls of high thermal mass, made of concrete and stones. 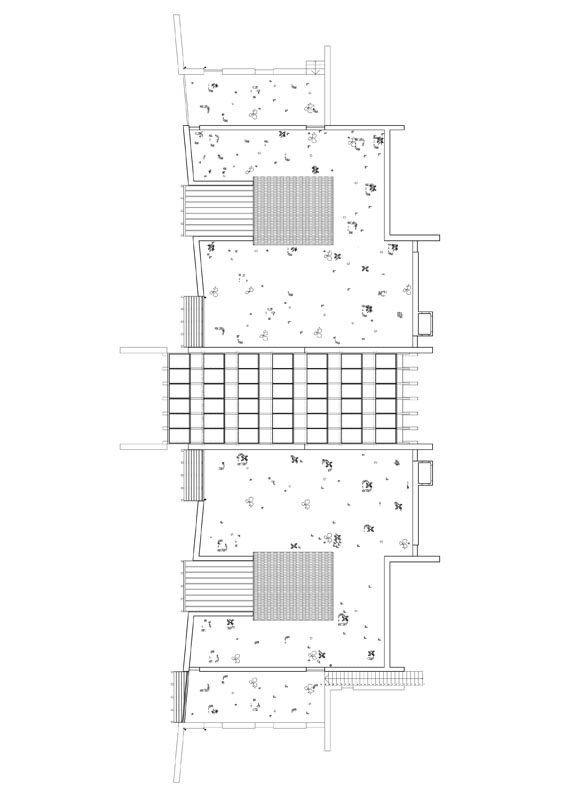 – Health System floating slab construction (on a bed of sand), based on used tires, and polished concrete. – It should be noted that for all the characteristics mentioned, ACTIO Complex, was described as “Model for Humanity project at Expo 2000 in Hanover.” It was exhibited in the Pavilion of the Future during the month of September and October of 2000.